More immigrants in Connecticut are applying for citizenship, creating a backlog that has led the federal government to send some applicants to New York to process their cases. The application process for new citizens has stretched from a median of about six months to more than a year as the line of applicants has grown. Advocates and attorneys representing immigrants say the backlog, which is also occurring nationally, is due to a combination of factors — an increase in more people filing for citizenship, and a deliberate slowdown aimed at discouraging new citizens from joining the ranks of fellow Americans. “In my world, people are frantic about it,” said Joshua Hoyt, executive director of the progressive Partnership for New Americans, a national immigrant rights organization. Nationally, there are 753,000 immigrants whose citizenship applications were pending at the end of March, about double what there were in 2014. In Connecticut, there were 7,652 pending applications in Hartford at the end of March, according to the U.S. 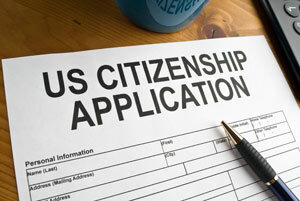 Citizenship and Immigration Service, or USCIS. That total did not include an unknown number of Connecticut applicants who live in Fairfield County and have had their applications transferred to Albany, N.Y., where 1,267 applications were pending. In the same time period three years ago in Hartford, 5,617 applications were pending. “It’s just getting more delayed, more delayed, and more delayed,” said Justin Conlon, an immigration attorney in Hartford. In the first two quarters of fiscal year 2018, there were 4,757 applications for citizenship filed in the Hartford office, according to the USCIS, as compared to 4,625 applications during the same period in 2015. While an increase of 132 applications is modest, it does not include those cases that have been transferred by USCIS from Connecticut to New York. USCIS could not provide that number Wednesday. Until April, USCIS processed all applications for citizenship in Connecticut in its Hartford office. “It’s a hassle for people,” said Aleksandr Troyb, an immigration lawyer in Stamford and past president of the Connecticut chapter of the American Immigration Lawyers Association. He said immigrants who have early morning interviews had had to secure hotel rooms to spend the night before their hearings in Albany. Immigration lawyers have also raised their fees to represent Connecticut clients in proceedings in New York. Whether they are processed in Hartford or Albany, all new citizens take the Pledge of Allegiance in a naturalization ceremony in Hartford. The next one is scheduled for Sept. 17 at the Hartford Public Library. Despite the hardship, which includes filling out lengthy applications, paying a $725 filing fee (which includes $85 for a background check), a medical exam, lengthy interviews — and for many, legal fees — advocates say immigrants are rushing to become U.S. citizens. Troyb said immigrants are filing for citizenship as soon as they can, instead of putting off the process, because people are worried qualifications will tighten under the Trump administration. “A lot of them are filing as soon as they become eligible,” Troyb said. Most immigrants are eligible for citizenship if they have held legal residency, or a “green card,” for five years, although legal immigrants who are married to a U.S. citizen can apply after only three years. But the Trump administration is expected to issue an executive order in the coming weeks that would make it harder for legal immigrants to become citizens or get green cards if they have ever used a range of popular public welfare programs, including the Affordable Care Act. As of now, most applications for citizenship are approved, even as the process has lengthened. For example, the Hartford USCIS office approved 2,217 applications in the first quarter of this year and denied 254. At the Hartford office Wednesday, a neatly dressed man from Yemen was attempting to navigate the complex application process. Saleh, who declined to give his first name, emigrated to Connecticut 11 years ago with his wife, but only recently decided to apply for citizenship. Saleh, who lives in Bridgeport with his wife and five children, brought his oldest son, who is 12, to translate during his interview because he was worried about his English proficiency. But the Trump administration in July hired dozens of attorneys to form a task force to review the records of people who have become U.S. citizens since 1990, in order to identify people who deliberately lied on their citizenship applications. “We finally have a process in place to get to the bottom of all these bad cases and start denaturalizing people who should not have been naturalized in the first place,” USCIS Director Francis Cissna said. Conlon said he noticed the citizenship process had become more “rigorous” about a year ago, with federal agents asking more questions about an immigrant’s background. “There is definitely more scrutiny,” said Wayne Chapple, an immigration lawyer whose office is near the Hartford USCIS center. Immigration lawyers and advocates say there’s nothing stopping the USCIS from hiring more personnel to deal with its backlog. That’s because the agency is funded by the filing fees immigrant pay, and not by Congress or the taxpayer, and can simply raise fees to cover additional expenses. To Hoyt the delays are simply a way to discourage people from becoming new citizens – and new voters. “The effect is voter suppression, that’s why we say the Trump administration has built a second wall,” he said. Julia Werth contributed to this story.